CFB’s opening weekend brings fans a couple compelling non-conference matchups and the chance to really focus on potential NFL draft prospects. Shawn Spencer makes his Inside The Pylon debut looking at the matchup between Josh Doctson of TCU and the cornerbacks of Minnesota, as well as Ohio State’s Michael Thomas against Virginia Tech cornerback Kendall Fuller. Thursday night, 233 days after the Ohio State Buckeyes were crowned National Champions, the FBS season finally kicks off. There are a few games with potential national championship ramifications, but for the most part, the slate features cakewalks such as Clemson versus Wofford. On the bright side, this means more focus can be placed on the individual battles taking place between potential NFL Draft picks. This weekend begins and ends with intriguing matchups outside the hashes. TCU at Minnesota kicks off the weekend on Thursday night. The Horned Frogs won this game last year 30-7 and until the season’s final week, it appeared as though this would be the non-conference win that launched TCU into the College Football Playoff. One of the stars of that game for TCU was WR Josh Doctson. The redshirt senior and potential first-round pick caught six passes for 64 yards and two touchdowns in the win. Minnesota’s game plan entering the game was to prevent Doctson ‒ and the rest of the TCU receivers ‒ from beating the defense deep. There are a couple key facts to take away from last year’s matchup: First, Doctson lined up exclusively on the right side of the formation while the Golden Gophers’ top cover corner, Eric Murray, played on the opposite side. Second, All-Big Ten CB Briean Boddy-Calhoun had not yet cracked the starting lineup, so all six of Doctson’s receptions came against Jalen Myrick, who is now a backup. Traditionally, Minnesota prefers to utilize a boundary CB (Murray) on the short side of the field and a field CB (Boddy-Calhoun) to cover the far side. TCU’s no-huddle offense forced Minnesota to play left CB and right CB, allowing the Horned Frogs to isolate Murray and exploit Myrick. What makes this year’s rematch so intriguing is Minnesota now has two very good CB prospects. Murray is the larger, more physical CB while Boddy-Calhoun has the better ball skills. TCU head coach Gary Patterson loves to create mismatches, and it will be interesting to see which corner he attacks with Doctson. Either way, Minnesota must be more physical on the outside to keep this game close. Closing out Week 1 on Monday night, Ohio State heads to Lane Stadium to take on Virginia Tech. The Buckeyes hope to avenge last season’s 35-21 loss, but if this game is anything like the previous one, who the wide receivers and cornerbacks are won’t matter. Virginia Tech sacked QB J.T. Barrett seven times while constantly pressuring the freshman in his second start. 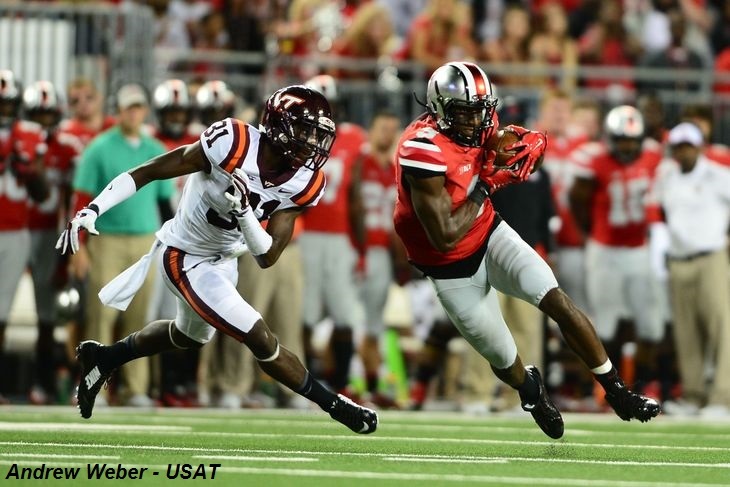 The only Ohio State receiver with more than one reception was Michael Thomas, the No. 6 WR prospect this author’s board entering the season. The Ohio State receivers simply couldn’t evade press man before the pressure got to Barrett. The cornerbacks who shut down the Ohio State receivers last year, Kendall Fuller and Brandon Facyson, both return in 2015. If the Virginia Tech corners begin the game as aggressively as they did last year, expect Ohio State to counter with quick double moves to get Fuller and Facyson off balance. At that point, it’s up to Thomas, Johnnie Dixon and even Braxton Miller to accumulate yards after the catch in order to create a balanced offensive attack. Many Power 5 schools are using this week as a walkthrough, but these two games will be as important as any for these receivers and corners. The winners of these individual matchups will begin the season with their draft stocks headed in the right direction. All footage courtesy of DraftBreakdowns.com. Shawn is a recruiter who spends his time breaking down film and studying NFL Draft prospects. He attended Central Connecticut State University and Kutztown University, graduating with a degree in business management.